University of Southampton academics at the forefront of world-leading research, discussion and decision-making frequently share their expertise via the media. If you’re a journalist seeking commentary for a news story or feature please contact the Media Relations Team on 023 8059 3212 or email press@southampton.ac.uk. Elite athletes competing at the highest level can find themselves under enormous pressure to succeed. Dr Nick Maguire, Associate Professor in Clinical Psychology, explains how this pressure can build and what happens when they can’t deal with it. “Sports men and women competing at the highest level can face enormous psychological pressure to succeed, which, if not supported, can result in high levels of anxiety and depression. This may in turn lead to loss of performance, sometimes catastrophically. “One of the main issues may be the way in which some people think about success and failure, for example that it is binary and that only winning matters. This may be compounded by thoughts about expectations of others, which may lead them to believe that they have let others down. Often the imagined disappointment of others can be as punishing as non-performance itself. “Another related significant factor may be that for years elite athletes devote time to their activity at the expense of all else. They therefore don’t have the opportunity to ‘develop’ other aspects of themselves from which they can draw self-esteem (eg parent, competent work colleague etc). Evidence indicates that with such multiple roles, real or imagined failure in one domain is mitigated by success in another. “Resilience is a key issue in continuing success. The ability to see ‘failure’ (for example not coming first or even in the top three) as a global and enduring one (‘I’ve failed so I must be a complete failure and it’s always going to be that way’) but rather part of a process of improvement may for some be important. Knowing that they have the unquestioning support of close ones may be important for others. Professor Tim Elliott, Director of the Centre for Cancer Immunology, University of Southampton, comments on the NHS approving a pair of cancer drugs that, in combination, boost the immune system to fight skin cancer. How many nurses do you need…? When I told my brother I was researching whether nurse staffing levels affect quality of care in hospitals, he answered directly: of course they do. Next question please. He wasn’t the only one to find my choice of research topic almost laughable. It seems obvious that the number of nurses on duty will affect nurses’ ability to deliver all the care needed by patients. Decades of research support this view: hospitals with better registered nurse (RN) staffing levels have better patient outcomes . When I present the research findings to nursing audiences the reaction verges on outrage. We’ve known this for years - why waste time and money on researching the blindingly obvious? In the last couple of years, following the Inquiry by Sir Robert Francis into poor care and high death rates at Mid Staffordshire, more and more people have heard about ‘safe-staffing’ and the importance of having enough nurses on duty. A few also know about the government’s policies in response to Francis: for example to put the patient first in decisions about staffing, and to require hospitals to publish data on how often staffing levels fall below the planned level. So three years after Francis, have the policies made a difference? Have we now got enough nurses on wards and in the community to meet patients’ needs safely? In 2010, our research found that almost half of the 400 hospital wards surveyed had staffing levels where RNs were caring for 8 patients or more. This is the level that NICE suggest is used as a ‘warning level’ to prompt review, as it is associated with increased risk of harm to patients. We cannot say whether levels have improved because this data is not routinely collected but other data shows a continued shortfall in nurse staffing numbers. Ninety-three per cent of Trusts report a RN supply shortage with high vacancy levels . Nine out of ten acute hospitals are staffed below the level planned. To plug the staffing gaps, hospitals have resorted to recruiting nurses from overseas and spent more on temporary nurse staffing. But this is an expensive short-term fix, which is not sustainable. The obvious longer term solution is to train more RNs. It’s good news, particularly on International Nurses Day, that nursing remains a very popular career choice. 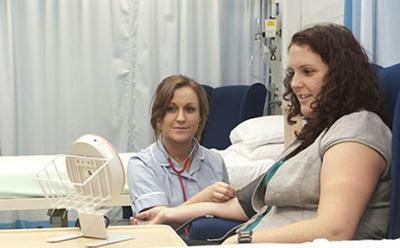 There are typically nine applicants for each nursing degree place available in the UK. But despite Health Education England, who is responsible for planning nurse training, saying 3,000 extra RN places were needed, only 300 spaces were funded, due to their budget being cut in the spending review. Nursing is once again on the occupational shortage list. Finances, not workforce planning, have dictated the decisions on how many nurses to train. As the Migration Advisory Committee put it, this is a shortage of the system’s own making. The NHS should be training the registered nurses it needs. If you’re a nurse, or related to one, the fact that there are not enough RNs on duty will not be news to you. You will be used to working for 12 hours and having to skip breaks. Eighty-six per cent of you will have left necessary care undone on your last shift due to lack of time . If you’ve been a patient in the last year, or know someone who has, you have likely noticed how stretched staff are. The recurring theme from patients and relatives I talk to is: what care we had was good – but staff just didn’t seem to have enough time. Having enough registered nurses – ie those with a minimum of 3 years of training – on duty is critical, not just to the quality of care that patients receive, but to their eventual outcome. Our research found that the chance of death for patients in hospitals that have good nurse staffing levels (an average of 6 patients or fewer for every registered nurses) was 20 per cent lower than on wards where each RN has an average of 10 patients or more. In the USA today, nurses are ‘taking DC’ to campaign for safe nurse staffing levels and protect patients from harm. Yet in England the NHS staff and managers I meet see little opportunity for things to change. For many nurses – even those in national leadership positions – it feels as though the window of hope that Francis’s report opened, is now closed and they must square up to the challenge on managing within the budgets that are allocated to them. Staffing according to finances, not need. Two things went wrong at Mid Staffs: the hospital took decisions about the workforce that were financially driven without considering the risk to patients; and staff got used to working in poor conditions, to making do and to ‘getting on with it’ without challenging the lack of staff. Patients and their relatives paid a heavy price for these compromises. We can’t keep accepting compromises that patients ultimately pay the price for. When we ‘make do and mend’ it’s care quality and patient lives that suffer. These aren’t our compromises to make. As a researcher I cannot change the way of the world. But I can keep collecting data that finds out if we have enough registered nurses to provide care safely. I can present these findings – to nurses, managers, policy makers and people like you, even if the results seem obvious. We often hear that some nurses are short of compassion, but for the overwhelming majority of the profession, this is simply not true and there is certainly no evidence that shows that this is the problem underlying current concerns about quality. We do however have ample evidence that they are often short of time, compromising their ability both to show that compassion and to maintain safety. Safe staffing is not an optional extra. Dr Sadie Jones, Outreach Leader in Astronomy, gives her thoughts on the Rosetta spacecraft mission to touch down successfully on Comet 67P Churyumov-Gerasimenko. Why this mission is important? “Well firstly, if successful, this will be the first ever soft landing of a robotic probe on a comet. Past exploration has only involved flying past comets and taking pictures so actually landing on one will be an amazing achievement given its equivalent to transferring an object from one speeding bullet to another. It's going to require some incredible parking skills that's for sure. “The comet is moving at 33,000 mph and it's gravity is 100,000 times weaker than Earth's, because of this lack of gravity this means that the Philae probe will have to attach itself firmly to the comet on impact. The probe will need to use landing leg screws and 2 harpoons to lock onto the surface and not bounce back into space. It also has some thrusters to stop it rebounding but whether they are working can not be confirmed. What the lander will do on the comet? You can also listen to this interview on Chirbit. What to do with Mein Kampf? What are we to make of the imminent reissue in German, 70 years after the death of Hitler, of Mein Kampf - the book that symbolizes like nothing else the destructive genocidal ambitions of the Nazi regime? "What does the decision to re-publish tell us about contemporary Germany's relationship to the Nazi past? The question of how to handle this uniquely toxic text goes to the heart of a problem that, in some respects, is as sensitive as ever, yet in others is unmistakably changing in quality." Read, in his Huffington Post Blog, more of the opinions of Historian Professor Neil Gregor, author of How to Read Hitler. "Mobile banking has more than doubled in the past year according to the British Bankers’ Association – should we be surprised at this? For many of us, the convenience of 24/7 automated interaction more than compensates for any perceived risk. Why waste time queuing in a branch? And it’s not just banking we can now do on the move – online educational opportunities via platforms such as FutureLearn are centred upon “bite sized chunks” of learning that can be carried out by phone or tablet while on the move. "As consumers we now expect instant access to online services at any time through the device of our choice, and competition in the crowded retail banking market is resulting in more and more innovation and convenience. But we can’t yet rely totally on mobile technologies – try arranging a banking transaction while on the train from Southampton to London with a network connection that is patchy at best. And international payments are another story entirely – banks have been very reluctant to lose the high fees they’ve charged over the years for providing such services. Perhaps the growing popularity of mobile banking will finally force modernisation in a system of currency exchange that is largely unchanged since Victorian times." Professor Robert Nicholls and Dr Sally Brown comment on sea-level rise and coastal impacts from the Intergovernmental Panel on Climate Change (IPCC) Working Group II report. “The AR5 report reaffirms the large threats associated with climate change, and better identifies the importance of and need for both adaptation and mitigation responses than earlier IPCC assessments. In the future we need to understand these responses much better at global, regional and local scales. "With rising temperatures and other climatic and non-climatic threats there is an additional environmental risk, such that extreme event today may happen more frequently. This will be most felt in those ecosystems or regions which are already very vulnerable to change, such as coral reefs or small islands: The adverse impacts of climate change will not be evenly spread and will often exacerbate existing issues. This report iterates what we have learnt since AR4, that unless we act, adverse impacts will still occur. Where we can adapt to climate change and sea-level rise, we can increase resilience and reduce risk. The challenge is the effectively manage this process, taking account the multiple causes environmental change. "Difficult decisions need to be made regarding adaptation. At times, these may cost more in the short term, but aim to provide long-term benefits and reduce risk. Thus, it is important to strategically plan for long-term benefits, whilst taking short-term needs in mind, and this is a challenging goal. This type of planning is starting to emerge. We still have a chance to reduce the adverse impacts of climate change, either by mitigation or adaptation, and we should take the opportunity to do so. Further research needs to bring together policy makers from global, national and local scales to achieve this version. "This report indicates that on the coast, adverse impacts are also influenced by socio-economic issues, such as rapidly growing populations. How societies evolve and respond to any type of coastal change is therefore important, and decisions ideally need to be made collectively with multiple stakeholders and at different government levels." "It is research coming together that leaves me more hopeful than I have ever been in my career about the treatments we can offer our patients today and what the future holds. Research has already helped save nearly 520,000 lives since the 1980s, and over the next 20 years mortality rates are projected to fall by 17%." "Invented by Sir Tim Berners-Lee 25 years ago, the World Wide Web has delivered lots of benefits and opportunities to human beings throughout the world. Big data might be another chance to change our lives. If the cost in all areas, such as storage, analysis and sharing, can be reduced, then big data should be very attractive in the future. Hence, it`s crucial for the UK to seize this opportunity now, at the very beginning, and to hold a good position by using advantages in education, research and industry. "Big data can provide better service to customers, more accurate business trends to companies and many other benefits to improve our lives. As an example, it will make health research more accurate because researchers will be able to obtain the full background information of patients. This could have major implications for the treatment and prevention of disease. "Big data is a hot field, which means there is a lot of competition to attract the best minds. In my opinion, the government needs to confirm that this funding will help the new institute to attract people who are able to compete or collaborate with all other big labs around the world, like AMPLab in Berkeley, and industrial labs such as IBM, Microsoft and Oracle, before making this investment." Professor David Coggon provided expert comment on research into the chemicals found in food packaging. “It is well recognised that leaching of chemicals from food contact materials may pose risks to health, and the European Food Safety Authority has an expert panel that advises on this problem. Based on toxicological assessment, maximum levels of contamination from, for example, plastics, are legally prescribed, and testing is carried out to ensure compliance. Sometimes products have to be withdrawn because they breach the limits. “That said, several aspects of the article by Muncke and colleagues are misleading. While formaldehyde has been classified as a human carcinogen, there is strong evidence that any effects on the risk of cancer, even from very prolonged high exposures, are small. Moreover, formaldehyde is formed naturally in the body, for example from methanol that is present in fruit. Thus we should only be concerned about relatively high exposures to the compound, and even then, any risks will be extremely small. “While it is important to consider the potential risks from endocrine disrupting chemicals in the diet, and this is done as part of regulatory risk assessment for chemicals, many of the most potent dietary endocrine disruptors are naturally occurring chemicals such as in soya. “The article refers to possible toxic effects from combined exposures to multiple contaminants which individually are all at low levels, but understanding of this area of science has advanced a lot in the past 15 years, and there is little to suggest that such combined exposures pose a threat to health other than in a few very specific circumstances. "Most historians would question the claim that the Habsburgs should not be blamed for causing the First World War [Guardian Report, 15 January 2014]. In 1914, certainly, each European state including Britain embarked on war to protect its vital interests. It is also true that the Habsburg Archduke Franz Ferdinand himself was usually a peacemaker and, ironically, if he had lived would have argued against war with Serbia in July 1914. However, most of the Habsburg elite in Vienna – following Emperor Franz Joseph’s mindset – were determined to crush ‘the Serbian snake’, and knew this risked provoking a European war. They took that risk and therefore they bear a large portion of blame for events spiralling out of control. The elitism of Austria-Hungary’s rulers and their paranoia about the Balkans has always been a key factor in explaining why the Great War finally occurred." Mark is holding a conference on the origins of the First World War, Sarajevo 1914: Spark and Impact. Dr Nick Maguire comments on England cricketer Jonathan Trott's decision to return home from the Ashes tour because of a stress-related illness. David's comments were used by The Evening Standard, Huffington Post UK and The Daily Express. "There are still uncertainties but the signal is clear enough to justify action: in fact we need less talk and more action. Uncertainty is a reason to be cautious, but not a reason to do nothing. On the contrary, uncertainty is a reason for taking action to avoid possible serious risks that we can foresee. "The only sure way to slow the rate of warming is to reduce emissions of CO2, caused mainly by burning fossil fuels. Geoengineering is not a solution that can help us here and now: there are far too many uncertainties, but it may be some help in the future if we do the research now. "Much of the CO2 stays in the atmosphere for a long time, and the climate will carry on changing for several centuries, and the effects will get bigger and last for thousands of years. "Man-made forcing by greenhouse gases has pushed the climate system out of balance, and it is still reacting. The land is warming faster than the oceans, which shifts weather features like the jet stream that affects the tracks of winds and storms. "Storms and floods and droughts will continue to occur, and are likely to become more frequent or worse, but we shall never know for sure whether any particular event was caused or made worse by climate change. "The recent slow-down in warming is interesting, but it may still be just a wiggle, maybe caused by a natural cycle in the ocean. If so we should expect more rapid warming in a few years time. There is no reason whatever to suppose that the slow-down is permanent: these things have happened before (eg 1950 to 1970), and no-one ever claimed that climate models could predict all these decadal wiggles. "The better estimates of sea-level rise are very welcome, but also very worrying: they mean a lot of trouble for many people in coastal areas and cities, later in this century, and the sea-level will continue to rise for many hundreds or thousands of years." Professor Shepherd's comments appeared on The Daily Mail. Nick Macklon, a professor of gynaecology and obstetrics, has given backing to a study into why recurrent miscarriages take place. The research shows how low steroid levels lead to some miscarriages. Speaking to the BBC, Professor Macklon said: “This is a crucial breakthrough in the understanding of recurrent miscarriage; it's the gateway to the clinical trial. "But what this shows is that steroids shouldn't be given to all, we need to be sure that is the problem in women before they're given." "The scale of forced population displacements within and from Syria puts great strain on Syria itself, in the case of internally displaced persons (IDPs), as well as on the neighbouring countries and the international agencies, such as the UNHCR. If the current UN estimates are even roughly correct, it means that about three in ten Syrians have been displaced: one in ten is a refugee, and two in ten are IDPs. The problems are amplified by the region not being very stable politically - the question of stability is particularly acute for Lebanon, which currently hosts the highest number of Syrian refugees. "At the end of 2012, the UNHCR estimated the number of Syrian refugees as 700 thousand and the number of IDPs as just over 2 million. Again, if the current estimates are even approximately right, it means more than doubling in the past eight months. Here, not only the numbers are an issue, but also very importantly the dynamics: the Syrian refugee crisis develops really fast, which makes it even more difficult to respond to. Given the conflict dynamics, the uncertainty surrounding the crisis makes adequate resourcing of the humanitarian responses very difficult. "In terms of the possible responses, there are short-term as well as long-term challenges: the former include the provision of basic humanitarian assistance, aid, education, etc., and the latter - the so-called "durable solutions" that the UNHCR aims for: repatriation, resettlement to a third country, or local integration. As long as the conflict continues, repatriation is not a real option for many people, while resettlement and integration will be difficult given the vast number of refugees. The danger is that temporary and interim solutions - refugee camps, limited integration with the host society, no full civil rights etc. - might become semi-permanent, as it already happened to Palestinian refugees in the region." Dr David Kinnison, chemical health and safety advisor, University of Southampton, & former UN weapons inspector, said: “Chemical analysis of environmental and human samples would indicate what chemical agent had been released and what the casualties had been exposed to. Chemical monitoring (using sensors specific for chemical agents) on site would also help determine what type of agent had been released. To be sure that a chemical weapon had been deployed would require further analysis with all available incident information assessed. The UN inspectors should have the necessary resources and facilities to establish if a chemical weapon has been deployed. “Video footage will provide some information, such as demonstrating casualties' symptoms. It can suggest what type of chemical the casualty may have been exposed to. But footage is also limited and to detect if a chemical agent has been deployed does require investigation on the ground (monitoring and sampling). “Chemical monitoring employed on the ground, which is generally immediate, would provide an indication of the type of agent that had been employed and in some cases an approximate amount. Many armed forces employ such systems to alert their troops to potential chemical attack. Dr Kinnison's views have been broadcast on BBC Radio 5live, BBC World Service, BBC Radio Solent and Heart FM. Physiotherapists and podiatrists have been given prescribing powers in the UK, meaning they can give medicines to their NHS patients. Dr Alan Borthwick, Senior Lecturer and Professional Lead (Podiatry) at the University of Southampton, played a key role in the plans through his position on the Department of Health AHP Medicines Project Board, as representative of the Allied Health Professions Federation. Dr John Marti, from Business, Law and Art at the University of Southampton, said: “Any short-term use is likely to be viewed historically as a missed opportunity. Sites of this size don't become available very often so it makes sense to carefully consider how it can safeguard the area's future prosperity." "It is very fitting that Jane Austen has taken pride of place on a banknote. Her witty skewering of the marriage market in her novels shows the relationship between gender, worth and debt. It's not just romance on her characters' minds; it's the fraught search for financial solvency when society's expectations are stacked against them. Austen kept her own accounts of income from her novels, and I expect she would have appreciated Emma Thompson's visit to her grave to tell her about the grosses from the film of Sense and Sensibility." Dr Myron Christodoulides, Reader in Molecular Bacteriology/Microbiology, comments: "This was indeed a very difficult decision for the JCVI to make, but close inspection of the JCVI interim position statement does emphasis that despite the extensive trials of this vaccine in 8000 infants, children, adolescents and adults, there appear – surprisingly - to be still many unanswered questions regarding Bexsero®. These trials have shown that the vaccine is immunogenic, but the committee noted that the immunogenicity of Bexsero in the ‘new’ UK immunisation schedule has not been completely assessed. It is clear at this point-in-time that the numbers of cases of meningococcal disease in the UK appear to be falling, thankfully, but it is difficult to predict what the future incidence will be, given the cyclical nature of meningococcal disease. Based on this, one would argue that the only practical study to see if this vaccine really protects against disease is population-based immunisation. Indeed, this will still be a major consideration for other experimental MenB vaccines currently in clinical trials in the UK and elsewhere, for which predicted strain coverage is similar to Bexsero (within confidence limits). Developing MenB vaccines continues to be a considerable challenge to scientists and clinicians and this interim decision highlights to me the need for increased support for basic vaccine research. "But for families who have lost loved ones to this disease and to the survivors who suffer life-long disabilities, the JCVI decision not to recommend Bexsero is moot. If Bexsero is introduced and efficacy predictions hold true, 60-80 individual lives will likely be saved this year. The opportunity has not been entirely lost and hopefully the decision does not set a precedent when other competitive MenB vaccines become available. However, in the continuing absence of an effective MenB vaccine for routine immunisation, we should all ensure that we reacquaint ourselves with the signs and symptoms of this devastating disease." Dr Christodoulides' comments have been reported in the Daily Mail. Professor Hazel Biggs, Head of the Southampton Law School and an expert in Healthcare Law and Bioethics, offered her views on whether people who register as organ donors should be given higher priority on the transplant list. The full interview with Professor Biggs is available on the BBC website. Professor Biggs also appeared on the BBC News Channel and her comments were reported in the UK by the Daily Mail.